Whenever a major-league closer comes in for a save opportunity, the lights shine the brightest and the pressure increases immensely. Any closer will tell you that he has one of the most nerve-wracking positions in all of sports. Nobody knows about this feeling more than former pitcher and closer Brian Fuentes. After graduating from high school, Fuentes found his next path at Merced Community College, where he played three seasons for the Blue Devils. The 6-foot-4 left-handed pitcher was drafted in the 25th round of the 1995 free-agent draft, number 678 overall, by the Seattle Mariners. From 1996 through 2000, he pitched for four different teams in the Mariners’ farm system. The first team was the short-season Single-A Everett AquaSox, for whom he pitched in 13 games in 1996 with a record of 0-1 and a 4.73 ERA. In 1997 Fuentes was advanced to the Wisconsin Timber Rattlers of the low Class-A Midwest League, where he saw more playing time. Fuentes was the starting pitcher in all 22 of his games with a record of 6-7 and an ERA of 4.39. In 1998 Fuentes moved up again, to the Lancaster JetHawks of the high-A California League. Still a starter, he was 7-7 with an ERA of 4.17 and 137 strikeouts. Then he spent two seasons with the New Haven Ravens of the Double-A Eastern League. Over the two seasons, still a starter, he was 3-3 and 7-12, with elevated ERAs of 4.95 in 1999 and 4.51 in 2000. The 2001 season was Fuentes’ final stop in the minor leagues; converted to relief duty with the Triple-A Tacoma Rainiers (Pacific Coast League). His ERA, at 2.94 in 35 games pitched (52 innings) was below 3.00 for the first time in his minor-league career. In June Fuentes was called up by the Mariners, and on June 2, 2001, he made his major-league debut, retiring two Tampa Bay Devil Rays in a brief relief appearance. After relieving in 10 games (1-1, 4.63 ERA in 11⅔ innings), Fuentes was sent back to Tacoma. After the season Fuentes was traded to the Colorado Rockies with Jose Paniagua and Denny Stark for third baseman Jeff Cirillo. In his first four years as a major-league player, Fuentes had a record of 8-8 with a 4.04 ERA with only four saves in 163 games. The Rockies planned to make him a closer. His unusual side-arm pitching style was often confusing to hitters, and his slider was especially effective against left-handers. 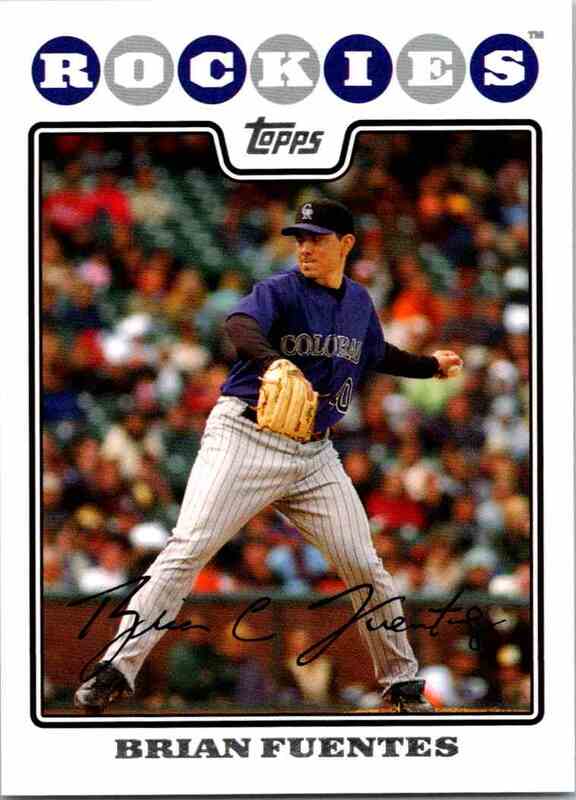 Between 2002 and 2004, Fuentes was shuttled back and forth between the Rockies and Triple-A Colorado Springs. In mid-May of 2005 he took over the closer role for the Rockies after Chin-hui Tsao was placed on the DL with a shoulder injury. He quickly showed enough to be selected for the National League All-Star squad, the first reliever and third pitcher in Rockies history to be named an All-Star. His 31 saves in 2005 matched Dave Veres for the third-highest single-season total, trailing only Jose Jimenez and Shawn Chacon. In 2006 Fuentes totaled 30 saves, and his performance earned him his second All-Star Game appearance. He pitched one inning, the sixth, and retired all three batters. As it turned out, Fuentes wasn’t the only one being defined that season. The Rockies wound up going on a historic late-season run, winning 13 of their final 14 games of the regular season and defeating the San Diego Padres in a deciding 163rd game to determine the NL wild card. For Fuentes, his appearance in this game was a frustrating one. He struggled with his command in the bottom of the eighth inning, giving up the tying run on two hits. The Rockies eventually won the game in the bottom of the 13th inning, giving the franchise its second playoff berth. Fuentes’ struggles still lingered but for the first time in his career he was playing in the postseason. He started strong in the Division Series against Philadelphia. In a three-game sweep of the Phillies, Fuentes worked in all three games, was the winner in the deciding game. In 2⅓ innings pitched in the series, he gave up one hit and struck out four. In the National League Championship Series against Arizona, Fuentes also worked in every game of the four-game sweep, throwing one scoreless inning in each of the first three games. After working six consecutive games without allowing a run, he gave up a three-run homer to the Diamondbacks’ Chris Snyder in Game Four. After a triple followed the homer, Fuentes was lifted for Corpas, and the Rockies held on to win, 6-4. Fuentes earned holds in Games Two and Three. In the Boston Red Sox’ World Series sweep of the Rockies, Fuentes pitched two scoreless innings in Game Two, helping keep the game close; the Rockies lost, 2-1. The Red Sox held a 6-5 lead in Game Three; Fuentes gave up three runs. In Game Four, the Red Sox held a 3-1 lead after seven innings. Fuentes was called from the bullpen to hold the lead, but surrendered a leadoff homer to Bobby Kielty. Though the Rockies rallied for two in the bottom of the eighth, the Red Sox won. Aaron Cook was the losing pitcher. The season hadn’t ended the way Colorado and Fuentes wanted, but the Rockies were National League champions and had capped off a season of epic proportions. About a month into the 2008 season, Fuentes regained the closing role. Corpas had been losing velocity and struggling with inconsistency, and the Rockies felt it was time to make Fuentes the closer again. From April 24 to the end of the season, Fuentes racked up 30 saves. Fuentes led the American League with 48 saves in 2009. He was picked for the All-Star Game for the fourth time. The Angels were champions of the AL West Division and swept the Red Sox in three games in the Division Series. Fuentes got saves in Games Two and Three, pitching 1⅔ hitless innings. The Angels lost the ALCS to the New York Yankees in six games. Fuentes pitched in three of the games and got a save in Game Five. All told, he gave up one hit and one run in three innings of work. Fuentes pitched in 9⅔ innings for the Twins in September as they wrapped up the AL Central Division title. They were swept by the Yankees in three games in the Division Series. Fuentes pitched in two of the games, giving up one hit in 2⅔ innings. Once again Fuentes was on the move when he signed as a free agent with the Oakland Athletics for 2012 and was demoted from being a closer. Released in July, he pitched briefly for the St. Louis Cardinals. (He requested time off in August for personal reasons.) He retired after the season. In the major leagues he had 26 wins and 43 losses, with 204 saves and a 3.62 ERA. He was a four-time All-Star. As of 2017 Fuentes lived in his hometown, Merced, with his wife and four children. In addition to the sources cited in the Notes, the author consulted Baseball-Reference.com. 1 Susan Slusser, “Brian Fuentes: From a Modest Start to Bold Relief,” SF Gate, March 8, 2011, sfgate.com/athletics/article/Brian-Fuentes-From-a-modest-start-to-bold-relief-2456206.php. 3 Sean Lynch, “Merced's Fuentes Announces Retirement from Baseball,” Merced (California) Sun-Star, November 14, 2012. mercedsunstar.com/news/local/article3271946.html#storylink=cpy. 4 Patrick Saunders, “Fuentes Out as Rockies Closer,” June 30, 2007. denverpost.com/2007/06/30/fuentes-out-as-rockies-closer/Notes. 5 Associated Press, “Angels Agree to Terms With Brian Fuentes,” ESPN.com, December 31, 2008, espn.com/espn/wire/_/section/mlb/id/3802383. 8 Mark Saxon, “Twins Get Angels LHP Brian Fuentes.” ESPN.com, August 28, 2010, espn.com/mlb/news/story?id=5504887.